Three scenes present themselves from memory: the first associated with gaelic football games such as were played at his school (St Columb’s College in Derry), the second from of a pleasure day spent on the riverbank and the third from Norse mythology. On the poet’s journey of re-envisioning, each will fuel the revelatory process going on in Heaney’s mind. An image of schooldays is suddenly posted on Heaney’s mind-screen (Those were the days – booting a leather football) drawing the acknowledgement that schooling was there to push Heaney as an individual truer and farther than you ever expected! The two principal skills of the game were kicking and catching. The football he kicked crossed uncultured, unfertile surfaces (rattling hard and fast over daisies and benweeds), made a dull impact (thumped) and yet carried a particular, as yet unaesthetic music (it sang too, a kind of dry, ringing) before fading away (foreclosure of sound). Enter allegory: school was not the best incubator for a young student with a bent for poetry; nevertheless the desire was present and had to be furthered; sonic charge was to be found in unexpected places; poetic impulses needed to be grabbed before they disppeared. Heaney imagines the arena in which his talent makes a great catch, prompting exhortations from the touch-line to make an impact on the score ( Point her!). ‘Was that really me,’ Heaney is asking himself, ‘with the technique to make a great kick (spring and unhampered mash-through! ); enter allegory. Was it you, Seamus, ‘young and aspiring’, Heaney asks himself, ‘or the ball, the poetic missile you launched, with its limitless potential’ (going beyond you, amazingly higher and higher) that in the end found an orbit for itself: ruefully free. 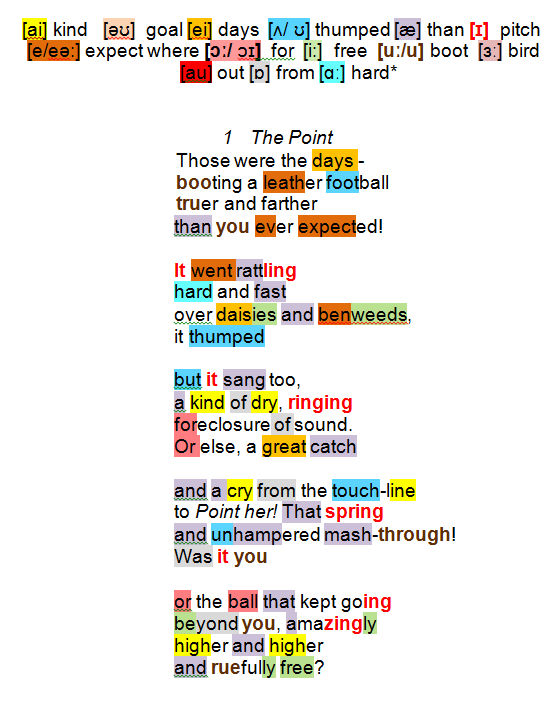 Reduced to its simplest, footballer and poet are one and the same: without the catch, nothing to work with … without the kick the ball would have had no momentum – no poetic aspirations would have been met … without the ball no game would have been played – no poetry composed. 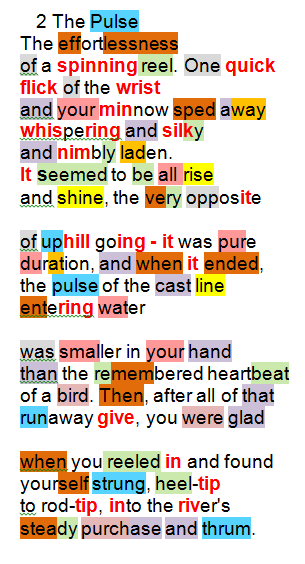 In a moment of completeness Heaney’s heart and soul are in perfect step with environment and activity. The barely perceptible sensation felt by the fly-fisherman is akin to the tiny vibration of creative impulses within the poet. The instant when the man and his river meld into a single frame provides the ‘marvel’ to be credited. Helen Vendler expresses it in her own erudite way; ‘such a self-aware book must also contain a nostalgia for first-order experience. This is most acutely felt in ‘The Pulse’. The pulse of the cast line entering water is evoked as the fleetest version of the tactile (‘smaller in your hand / than the remembered heartbeat / of a bird’), and then, to ‘touch evanescent’ is added ‘touch resistant’ (139-40) . Heaney revealed to DOD (p95) that in fact he was not a seasoned fisherman himself: I wanted to fish with a fly and just never stayed at it long enough to cast, so that effort fizzled out … But inside my sixty-eight-year-old- arm there’s a totally enlivened twelve-year-old one, feeling the bite. Everything comes together! When Heaney has a line, fishing or poetic, to cast it is effortless thanks to the fine engineering of his spinning reel … its sudden man-powered release (One quick flick of the wrist) generates momentum (your minnow sped away) … its nuances of sound and smoothness are barely perceptible (whispering and silky) … its skilled construction holds it all together in flight (nimbly laden) … its contribution is in upbeat tune with the activity (all rise and shine) … the moment is one of pleasurable relief (the very opposite of uphill going) … time slows down to offer pure duration between the fly propelled and its watery touch-down. The poet’s fishing-fly transmits a tiny landing pulse as imperceptible as the life signs of nestlings Heaney handled as a boy: smaller in your hand than the remembered heartbeat of a bird. After the cast with all its runaway give comes the moment of retrieval (you reeled in) – angler, nature and the forces that govern it are in perfect stasis (yourself strung, heel-tip to rod-tip, into the river’s steady purchase and thrum). The gentle stasis of a perfect fly-fishing scene is replaced by an incident of fishing mayhem from Norse mythology. Heaney recounts the prodigious tale of Thor in pursuit of the World Serpent and spots a correspondence. In the world of Norse titans (Thor and the giant Hymer) it was no trivial fish that got away, rather the monstrous the world-serpent itself. Baited with an appropriately massive ox-head the cast was equally colossal: spun high / plunged into the depth. Reeling in the catch however (the big haul) ended in double disaster: Thor’s foot went through the boards and his fishing companion panicked and cut the line with a bait-knife. 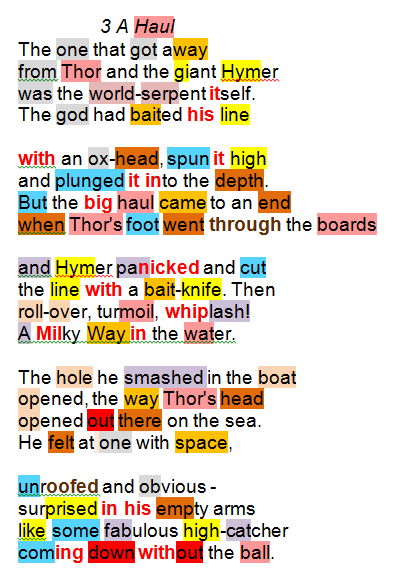 The resulting jerk caused pandemonium: violent loss of buoyancy (roll-over, turmoil, whiplash), a maelstrom (Milky Way) of water effects, a boat with a hole in it, a major Norse god stunned (Thor’s head opened), feeling all-at-sea at one with space , looking round for support (unroofed), deprived of dignity (obvious). For a moment poet and Norse god are alike: Heaney, vulnerable and exposed following the loss of his remaining parent, Thor with no world-serpent within his grasp – each is taken aback (surprised in his empty arms), In Gaelic football terms, both are flummoxed like some fabulous high-catcher coming down without the ball.